Photograph of Fytche Square, Rangoon (Yangon), taken by Philip Adolphe Klier during the 1890s in Burma (Myanmar). 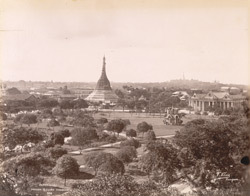 This is a view over Fytche Square (now Mahabandula Garden), looking towards the Sule Pagoda. The square dates from 1867-68, when a vacant, swampy site originally known as Tank Square was cleared and laid out as a public recreation ground. It was named in honour of the then Chief Commissioner of British Burma, Sir Albert Fytche. During the mid- to late-19th century, the British rebuilt Rangoon as a colonial city on a geometric grid plan and wide, tree-lined streets were laid out around the Sule Pagoda, establishing it as the centre of the city. The pagoda is built in the traditional bell shape of the Burmese stupa or zeidi, and is also gilded. Rangoon's most famous stupa, the Shwe Dagon Pagoda, can be seen silhouetted on the horizon.